Hurtigruten utilizes the WebmarketingMatrix to get an overview and prioritize web activities. 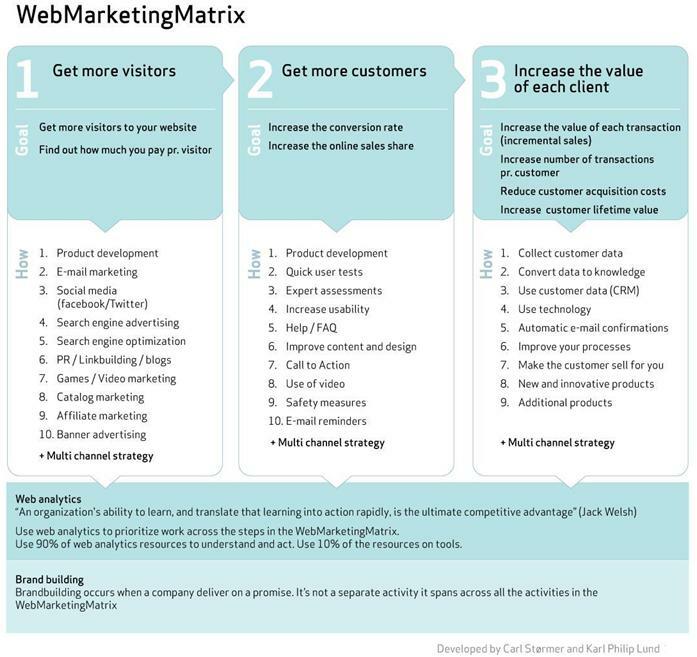 The matrix serves as an “À la carte menu” for selecting and prioritizing marketing activities. Web analytics is used to measure activities and to find the optimal marketing mix. Due to budget constraints, we give priority to activities that yield the highest measurable results. This section of the matrix covers all activities that attract visitors to the Hurtigruten websites. We measure the effect of these activities by counting the number of visits to our websites and by calculating the marketing cost per visitor in different marketing channels. The most primitive way to calculate the marketing cost per visitor, is to divide the total marketing budget by the number of visitors. This will give us a rough estimate of how much we are willing to spend to acquire one visitor.